SFist » Make a comment! It’s a phrase that’s been liberally applied to our fair city, perhaps most notably when the mayor of the Paris of, um, “France”, arrived in San Francisco last November to commemorate the 10th anniversary of our “Sister Cities” agreement. Never heard it? A quick Googling brings up a hefty 7500 matches, and as the scanning of turn-of-the-century tomes marches forward, that number will certainly increase. But to the point; sure, all of our friends from The Continent flatter us by calling San Francisco the “most European of America cities”, but where did this phrase originate? The website of the venerable St. Francis Hotel gives credit to the Charles Crocker family for the phrase, but since the Crockers built that hotel, we were suspicious. Gilded Age Mayor James Phelan certainly popularized the phrase in connection with the “City Beautiful” movement and his pet plan to make the city over into a genuinely world-class cultural center. Phelan employed visionary city planner Daniel Burnham to draw up blueprints for a completely new San Francisco, plans which would have given San Francisco Parisian-style radial boulevards, classical monuments, and a massive park system. Though the city was practically erased by the 1906 Great Fire & Earthquake, that opportunity to make this neo-Gallic dream come true more or less passed us by. But “Paris of the West” was not original to Phelan or Burnham either … it was already in the air. Perhaps it had to do with the multi-cultural nature of the early city, perhaps with its densely-packed old-world streets, its myriad music halls and saloons, or the fact in the 1870s there were more Frenchman in San Francisco than any other American city outside of New Orleans … in any case, that’s when the phrase starts showing up. At that time San Francisco boasted more restaurants than any city on earth other than Paris, and yes, a disproportionate number of them were French. 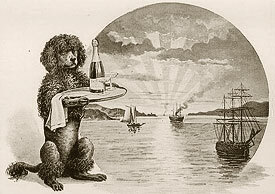 We’re reminded of the appearance of the first one in 1849, the infamous Poulet D’Or, whose name the semi-literate miners quickly mangled into “Poodle Dog”. (It means “Golden Chicken”, but okay, close enough.) San Francisco’s affair with France would continue for decades, culminating in the 1924 dedication of our very own temple to French culture, the Palace of the Legion of Honor. But because Paris was the world city around the turn of the century — the center of art, the center of culture — it was the place which every other city with pretensions to civilization compared itself to. Who were those pretenders? Montreal, Merida, and (on the way to “Rock City”), Detroit! Though just for the heck of it we’d love to give Sam Clemens the credit, we cannot tell a lie: we haven’t the foggiest idea.